I got some of my Purple honey comb blocks done this week, 2 blue/purple and 3 lilac blocks. I have not sewn the top and bottom together yet. It is better to leave them like this and sew the quilt top together in rows of half blocks. I got the pattern for the honey comb blocks Here. 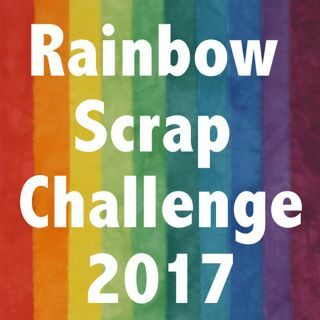 This post is added to the Rainbow Scrap Challenge 2018 and the linky party over at Soscrappy today. I have also added this post to Oh Scrap. I worked hard at cutting and sorting my purples this week. A tray of sorted and trimmed up squares and a few triangles at the top. I have 2" squares, 2 1/2" squares and then some 3" squares. I have a few different projects planning that will use these sizes. The sampler blocks over at Soscrappy can be done mostly from this tray. I did blue blocks that were 10" finished and used the 2 1/2" squares and triangles. I might also make a smaller size too. This is the main box of purple. Well sorted and looking pretty tidy. The bits a pieces that do not fit anywhere. I will use this stack to start a few crumb blocks later in the month. You have lots of pretty purples! I'm impressed with your cutting and organizing, too. Such a wonderful array of PURPLE scraps for the RSC!! Have fun making the rest of your blocks. That is going to look so cool!!! You have fabulous purple to play with & Great pattern for your blocks. I love seeing your new honeycomb blocks each month--so pretty! I am in love with your honeycomb blocks. You sure have a lot of yummy purple scraps! Wow, what a lot of purple. Those crumb blocks are going to be fabulous. I love your purple blocks!